1.1 WHAT PLANT CAN I BUY FOR CHRISTMAS? 1.2 What are the favourite plants in Christmas? 1.3 What are the main plants you can see in Christmas? WHAT PLANT CAN I BUY FOR CHRISTMAS? 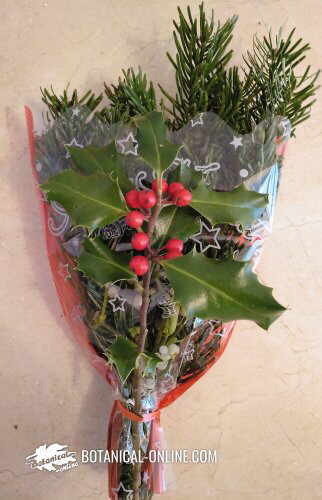 Decorative bouquet to give as a gift at Christmas. 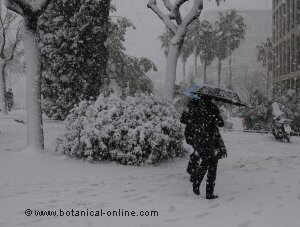 Formed by typical Christmas plants, such as holly, mistletoe or pine. What are the favourite plants in Christmas? In Christmas there are some plants that acquire a special interest, because they decorate our homes with their elegant semblance in a moment when there are not to many flowers, like poinsettia. Other, as mistletoe, because they have been chosen as a symbol of Christmas and it is part of the tradition for them to be with us during these days. What are the main plants you can see in Christmas? Considered as an amulet of good luck, mistletoe floods the squares where Christmas products are sold as a Christmas token. It is said that people who buy a little stem of this plant, will have good of luck the coming year. This belief has almost put the species in danger of extinction in many places. 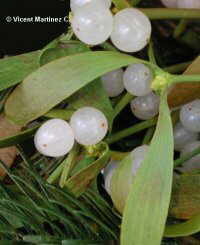 Mistletoe is a very valuable plant for its medicinal properties. Constituting one of the best resources to reduce the blood pressure. In most of the cases its sale is illegal and its purchase should be avoided not to put in danger the survival of the species. 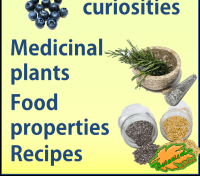 More information about its medicinal properties. More information about its cultivation . 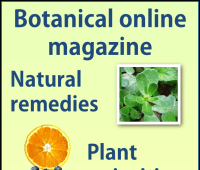 Holly is a plant with medicinal properties. 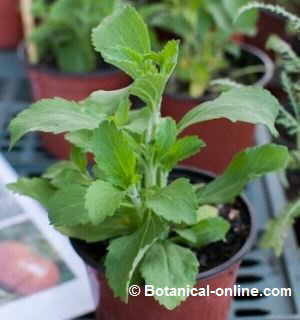 Its leaves and its bark have been used to cure fever and rheumatism, although it can be toxic. It seems the rabbits enjoy gnawing the branches, what returns them their appetite in the event of inappetence. 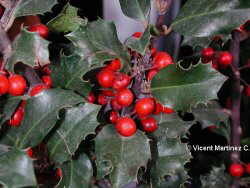 Holly is another of the plants very used in Christmas to decorate our homes. 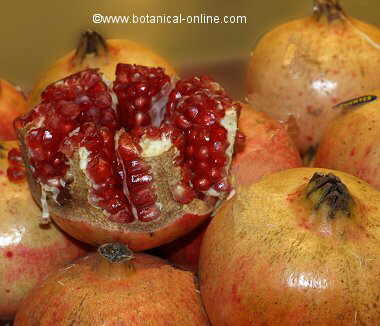 It is usually sold in form of cut branches, replete of brilliant red fruits. The habit seems to come from the Romans that used to decorate the streets with branches during Saturnalia festivals. 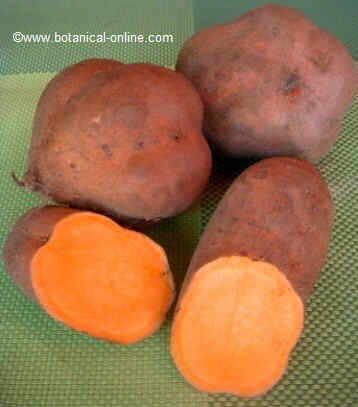 Its fruits, toxic for people, are very nutritious for numerous species of the forest that sometimes have these fruits at their disposal as the only alimentary resource. The habit of cutting its branches has supposed a setback in the species that has been legally protected. Butchers’ broom is a plant of the asparagus family. As matter of fact, it is very related with asparaguses, since people used to eat the tender buds of butcher’s broom as if they were so. In many places its branches are used to make brooms, hence the origin of its popular noun. 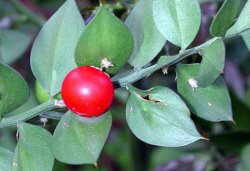 It is another of the plants whose branches, adorned with beautiful fruits in form of red marbles, are cut and sold during Christmas holidays. Its leaves are practically invisible and what appear to be real leaves are, in fact, the cladodes, some modified stems, ovate -lanceolate, ending with a sharp little spine, working as leaves. 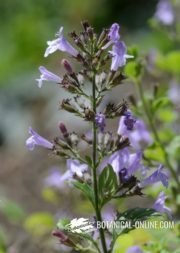 It is a plant with very valuable medicinal properties because it helps us to eliminate water of our body, so that it will be very useful in illnesses like obesity, rheumatism or dropsy. The habit of selling cut branches in Christmas has reduced the extension of the species considerably. A very enlarged photo of the plant. Its scientific name Pulcherrima is due to the fact that it was supposed to be one of the most beautiful plants (Pulcher in Latin means, the tidiest, the most beautiful). It is also known as poinsettia because it was introduced in United States by Joel Robert Poinsett in 1825. 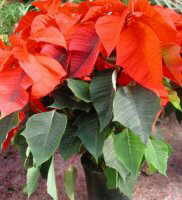 It is one of most appreciated plant in United States, so that December 12 is known as the National Day of Poinsettia. It would be wiser for us to use its another popular name, Christmas Star, since this plant shines with its own light during these days. Belonging to Spurge family and native from Mexico, this plant is particularly interesting because of its bracts, which look like red or yellowish petals. Its flowers are yellow and very small. There has been many discussions on the possible toxicity, although it seems that it is less toxic than it was supposed to. Anyway, don’t refrain ourselves to buy it during these days so that it can cheer our homes with its amazing colors. More information on plant care.